White china silk with polychrome painting in plant motif; "compères" front; boned at center back; matching petticoat. The entire dress is hand-painted with motifs of flowers, butterflies, and birds. During this period in which Chinoiserie was so popular, hand-painted China silk, woven from plain silk, was imported from China, and later reproduced in Europe for its high demand. In the portrait of Madame de Pompadour by François-Hubert Drouais(1727–1775) ("Madame de Pompadour at her Tambour Frame", 1763-64, National Gallery, London), the Madame is, in fact, wearing a dress of hand-painted China silk. 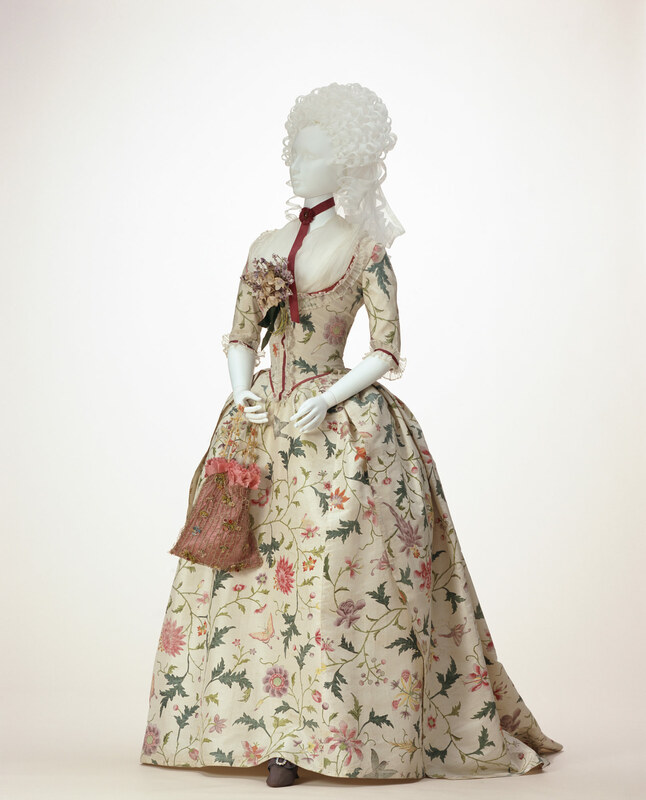 Accompanied by the simplification of clothing worn outside of the royal court, during the 1770s, women's clothing progressed in the direction of functionality. As one can see, the dress' pleats are sewn into the waist and stop there; this style is known as "Robe à l'anglaise".